The labbits have faith that Chef Jimmy will come up with something delicious. 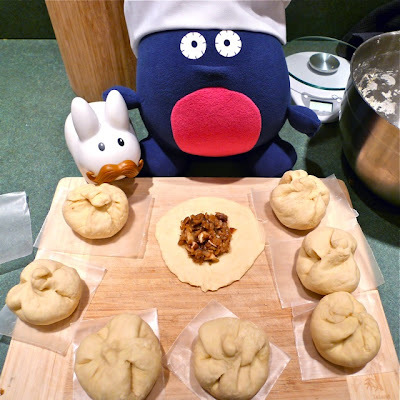 For his first day at the warren, he made vegetarian dim sum bao, which is a steamed dumpling shaped bread, stuffed with a variety of fillings. One of the most popular bao is char siu bao, a bun filled with BBQ pork. Jimmy often ducks out of the Toronto Monster Factory headquarters and up Spadina Ave for a quick nibble of char siu bao. 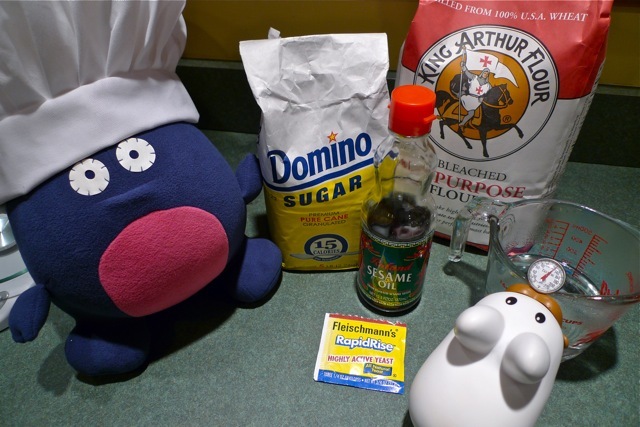 Knowing the labbits are vegetarian, he decided to raid the labbit pantry and put together a labbit version. He ended up using bean sprouts, shiitake mushrooms, water chestnuts and Lightlife Gimme Lean vegetable protein. It pan fries and crumbles just like ground meat. Then he threw in some soy sauce, hoisin sauce, white pepper, salt, and ginger, and stuffed the bao. You can add make vegetarian filling with tempeh, diced carrot, scallions, BBQ sauce, Sriracha sauce, cabbage, bok choy...there are lots of savoury options! Embrace Jimmy's free spirit and use what's in your fridge. No amounts for the filling are provided below, just be sure you have at least a full cup and a half to 2 cups of filling for 8 bao. And, you know what? 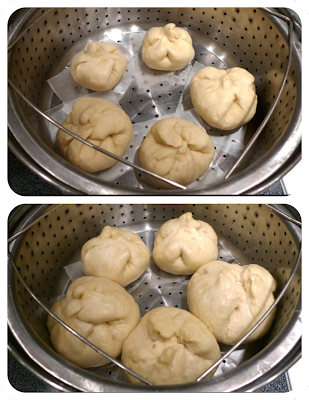 Steamed bao without any filling is pretty tasty, too! Just ball up the dough and steam. You can print out the recipe below by clicking here. Note: No exact amounts for the filling were provided, but you can choose whatever savoury fillings you'd like. Just be sure that everything is finely chopped, and that you have about 1.5 to 2 cups of filling "stuff" for your 8 bao. In a large bowl, dissolve yeast and sugar in warm water and allow to rest for 5 minutes. Add the flour and sesame oil. With clean hands, knead the dough until smooth, about 10 minutes. 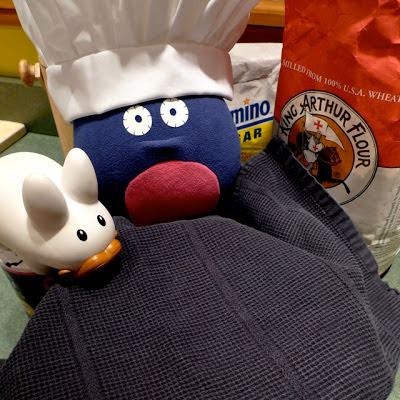 The dough will be very sticky! 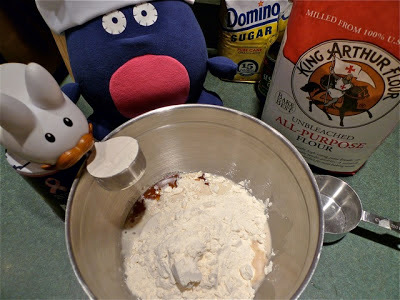 Add up to 4 more tablespoons of flour if needed. Cover bowl with a cloth and set in a warm spot in the kitchen. Let dough rest for 10 minutes. Meanwhile, prepare your filling. Wash and finely chop the vegetables. In a small skillet over medium heat, heat a small amount of sesame oil - just enough to coat the skillet. Pan fry the vegetable protein. 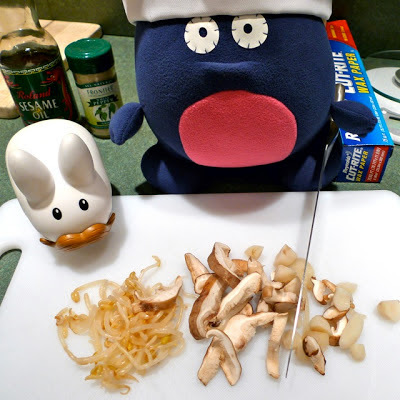 Add the vegetables and cook until the mushrooms soften. Remove from heat. Add salt, pepper, soy sauce and other desired condiments to taste. (You don't need much!) Set aside. Remove the cloth from the bowl. Roll your dough into a long cylinder and divide the dough into 8. With your hands, flatten the divided dough into round disks. Spoon 2 heaping Tbsp of filling into the center of the bao - yes, it will look very full! Bring up the sides, squish together at the top and give it a little twist to seal. Top: before steaming Bottom: apres steam! Place bao on a square of wax paper and set in a steamer basket, making sure you leave room for these bad bao to expand, because expand they will! Cover your pot/steamer basket and steam for 10 - 15 minutes. 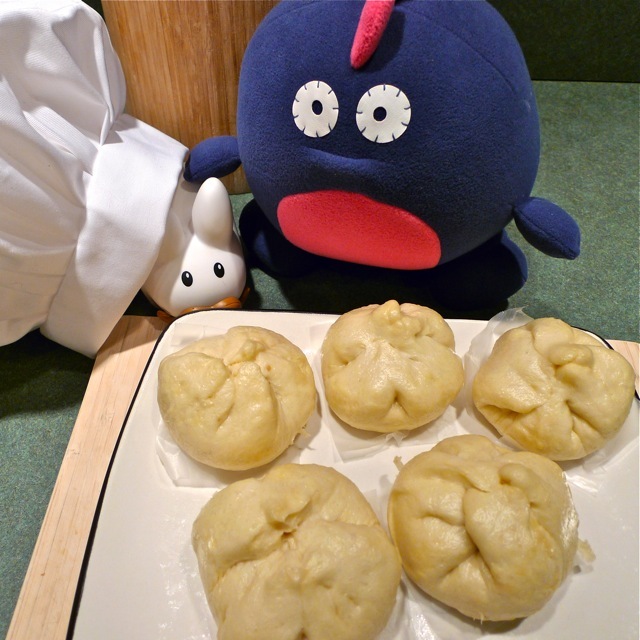 Carefully remove bao from steamer, and enjoy, remembering to remove wax paper before nomming away! Yields: 8 very big bao!! This looks so tasty! 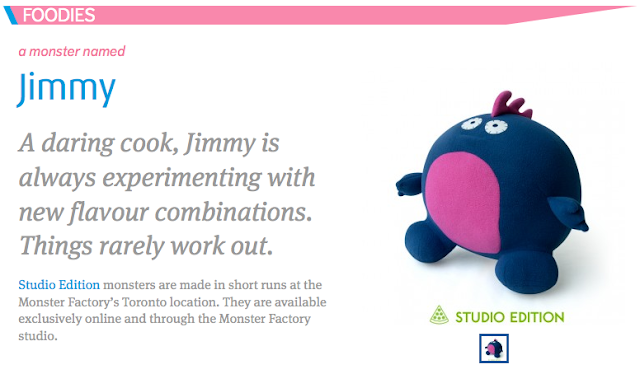 Well done, Jimmy and Pipkin!